Join Us for the 60th Anniversary Grand Reunion! 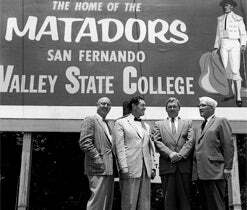 CSUN is celebrating its 60th birthday with a spectacular event. Alumni, students, parents, faculty, staff and community from every era are invited to take part in CSUN's 60th Anniversary Grand Reunion on campus on Saturday, October 13, 2018. 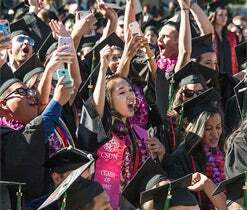 The day’s events will include a Grand Reunion picnic on the Delmar T. Oviatt Library lawn, campus tours, food trucks, a beer and wine garden, main-stage entertainment, kids’ zone and much more. Additional events scheduled throughout the weekend include a Matador Fun Run 5K, Founders’ Luncheon honoring graduates of 1968 and other mini-reunion gatherings for special constituencies. Whether you’re a competitor or not, this event is for you. Join us as we run or walk through our campus 5K. Proceeds will benefit student programs. Click here for pricing and details. For parents of first-time and transfer students, Parent Orientation is hosted by the Office of Student Involvement and Development. Make a day out of it! All parents and families are welcome to stay for the Grand Reunion Picnic. Click here for program details and to register. By invite only to alumni from Class of 1968 and faculty who started at CSUN in the same era celebrating their 50th Anniversary and class reunion. Includes, lunch, brief program and pinning ceremony. Food Trucks, including Middle Feast, Peaches BBQ & Smokehouse, Epic Tacos, The Green Truck, Rice Balls of Fire, The Boba Truck & Dreamy Creations. Live Student Talent Competition on the Main Stage, featuring Taiko, Acasola, JazzA, Ballet Folklorico, and Fasmode. Student groups will be competing for a $2000 prize from alumni sponsors! Campus Tours; both walking and shuttle tours will depart from Lindley Ave. at 1:30, 2:30, 3:30 and 4:30 pm. Reunion Gatherings on the Oviatt Lawn, including Associated Students, Athletics, Black Family, Granny Girls, all current student Greek organizations, Recreation & Tourism Management, USU, and more to be announced! Join CSUN Student Housing and Residence Halls Association for a Corn Hole Tournament on the Sierra Lawn! Compete on the Matador Motorway; Purchase a pinewood derby car to race against other alumni and students on our giant Matador Motorway. Proceeds benefit the MataCare Fund, which helps students who need short-term financial support. CSUN’s Men’s soccer team takes on the Mustangs. Game times are subject to change, please visit gomatadors.com for latest info and tickets. CSUN’s Women’s soccer team clashes with their Big West rivals. Kick off event for the Men's and Women's Basketball teams, with an introduction to staff and players. If you have any questions regarding Grand Reunion Weekend festivities, please call 818-677-2786 or email alumni@csun.edu.